Publishers Publishing RSS Feeds, eNewsletters, Obituaries! My subscription to the local newspaper ended over a year ago, but I continue to receive emails as if I were still an active subscriber. After I discontinued my subscription, I wanted to see if there was any noticeable difference between being an active or ex-subscriber or not. The same holds true for the magazine subscriptions I have since let lapse as well. All publishers can’t help but publish and with a few financial publisher exceptions, all publishers publish some version of their content on the web for all to see or grab via RSS for free. After I ended my local paper subscription, I would occasionally visit their web site to catch up with the local daily news. I then began comparing what news I could get free online to what I could get offline in their $.75 version at the newsstand. It soon became apparent to me the only difference between the online and offline versions of the same piece of content was how much time and money it took for me to consume it. The problem for newspaper publishers is that it takes me considerably less time and no money to consume their product online while the opposite is true for the offline version of their product – the newspaper. I continue to visit the paper’s website when I choose at no cost, while I now seemingly receive more frequent emails notifying me of additional opportunities to get more of their news more conveniently at no further cost to me through their new eNewsletters. 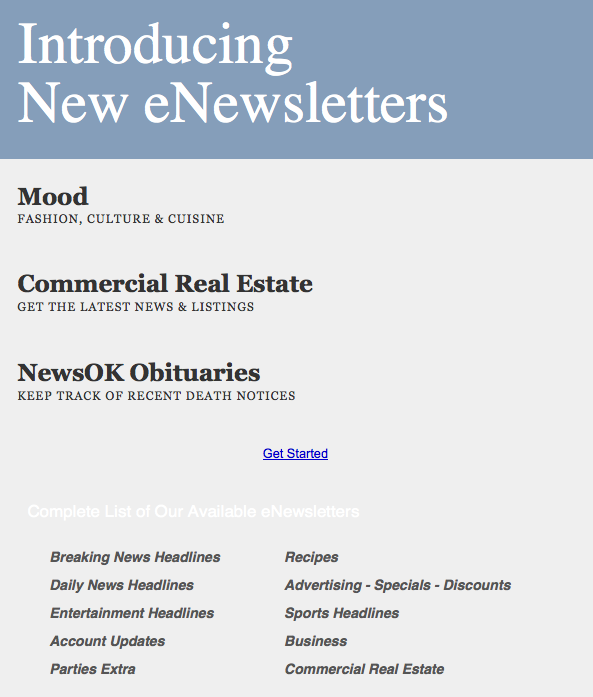 Today’s free content… uhm eNewsletter example? Where again do I sign up to receive daily emails chock full of people who have recently departed this earthly plain? This entry was posted on January 14, 2011 at 2:09 pm and is filed under Pushing eNewsletters. You can follow any responses to this entry through the RSS 2.0 feed. You can leave a response, or trackback from your own site.